Many test and mail's I am getting are incredible great feed backs on how to use SmO2 trends and information for training intensity control. I like to start slowly here to add the second metric we have with MOXY the tHb into the discussion. I believe that both SmO2 as well as tHb can increase immensely the feedback we get from the working area , but as well from the total systemic respond. tHb is a great indicator of blood flow ( volume ) respectively Delivery. tHb can change fast and with fast I mean fast or immediately. This most often indicates a immediate direct mechanical change in blood flow ( volume ) on the tested area. Possible mechanism are ( Gravity / direct compression from outside. Direct compression due to muscle contraction ) so mechanical reasons. Than we can have slower reactions in connections with feedback information from the systemic blood flow or circulation. This reactions are clearly slower (lag) and a reason of longer steps needed to see this reactions ) but as well the systemic reaction are slower in the recovery like a vasodilatation due to CO2 or a vasoconstriction due to CO2 or a vasodilatation due to blood pressure corrections or more often a vasoconstriction due to blood pressure correction. Here to just warm you up with some of the interesting reactions we can actually see, when integrating tHb into the full assessment picture. One pic is a local mechanical reason of tHb changes. another pic is a systemic blood pressure reaction and one is a systemic blood volume shift. ??? And here some add on to show how systemic reactions will be visualized if looking properly on tHb reactions. Here a nice example and sooner or later NIRS / MOXY will be used to look at this interesting trends , as soon we start to look more on tHb and not just on oxygenation trends. At the end delivery ( tHb) is a big part of oxygenation. No delivery no oxygenation. J Physiol. 2012 Dec 15;590(Pt 24):6285-96. doi: 10.1113/jphysiol.2012.241190. Epub 2012 Oct 1. Skeletal muscle vasodilatation during maximal exercise in health and disease. Maximal exercise vasodilatation results from the balance between vasoconstricting and vasodilating signals combined with the vascular reactivity to these signals. During maximal exercise with a small muscle mass the skeletal muscle vascular bed is fully vasodilated. During maximal whole body exercise, however, vasodilatation is restrained by the sympathetic system. This is necessary to avoid hypotension since the maximal vascular conductance of the musculature exceeds the maximal pumping capacity of the heart. Endurance training and high-intensity intermittent knee extension training increase the capacity for maximal exercise vasodilatation by 20-30%, mainly due to an enhanced vasodilatory capacity, as maximal exercise perfusion pressure changes little with training. The increase in maximal exercise vascular conductance is to a large extent explained by skeletal muscle hypertrophy and vascular remodelling. The vasodilatory capacity during maximal exercise is reduced or blunted with ageing, as well as in chronic heart failure patients and chronically hypoxic humans; reduced vasodilatory responsiveness and increased sympathetic activity (and probably, altered sympatholysis) are potential mechanisms accounting for this effect. Pharmacological counteraction of the sympathetic restraint may result in lower perfusion pressure and reduced oxygen extraction by the exercising muscles. However, at the same time fast inhibition of the chemoreflex in maximally exercising humans may result in increased vasodilatation, further confirming a restraining role of the sympathetic nervous system on exercise-induced vasodilatation. This is likely to be critical for the maintenance of blood pressure in exercising patients with a limited heart pump capacity. and here another nice information. Acta Physiol (Oxf). 2010 Aug;199(4):393-406. doi: 10.1111/j.1748-1716.2010.02125.x. Epub 2010 Mar 25. Disparity in regional and systemic circulatory capacities: do they affect the regulation of the circulation? In this review we integrate ideas about regional and systemic circulatory capacities and the balance between skeletal muscle blood flow and cardiac output during heavy exercise in humans. In the first part of the review we discuss issues related to the pumping capacity of the heart and the vasodilator capacity of skeletal muscle. The issue is that skeletal muscle has a vast capacity to vasodilate during exercise [approximately 300 mL (100 g)(-1) min(-1)], but the pumping capacity of the human heart is limited to 20-25 L min(-1) in untrained subjects and approximately 35 L min(-1) in elite endurance athletes. This means that when more than 7-10 kg of muscle is active during heavy exercise, perfusion of the contracting muscles must be limited or mean arterial pressure will fall. In the second part of the review we emphasize that there is an interplay between sympathetic vasoconstriction and metabolic vasodilation that limits blood flow to contracting muscles to maintain mean arterial pressure. Vasoconstriction in larger vessels continues while constriction in smaller vessels is blunted permitting total muscle blood flow to be limited but distributed more optimally. This interplay between sympathetic constriction and metabolic dilation during heavy whole-body exercise is likely responsible for the very high levels of oxygen extraction seen in contracting skeletal muscle. It also explains why infusing vasodilators in the contracting muscles does not increase oxygen uptake in the muscle. Finally, when approximately 80% of cardiac output is directed towards contracting skeletal muscle modest vasoconstriction in the active muscles can evoke marked changes in arterial pressure. I got a great question from Slovenia. Can we use this idea of tHb practically and do you have an example for swimming. I like to show you a swim workout done by Dominique a top coach in Montreal with some world class swimmer. I do not like to discuss the result on here , as this is a part we do with the coaches. 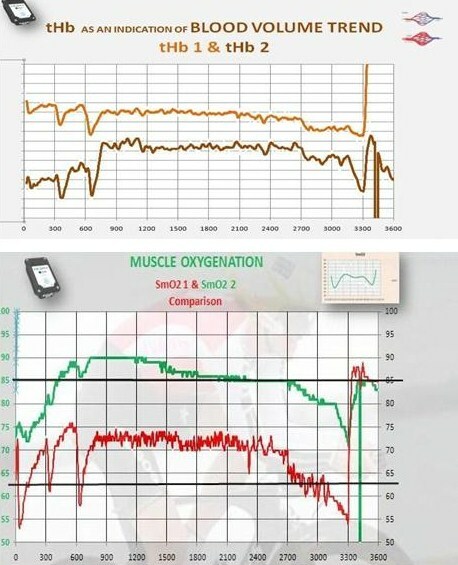 I like to show you here simply the workout and the very different reaction and as you will see SmO2 gives only a feedback on the utilization reaction of O2 but tHb actually will tell you why we see this specific utilization trend and what was limiting further changes or the actual workout. Here the SmO2 workout picture followed by the tHb workout picture and than the PP with an example on how we look at the information closer with coaches and test centers to make individual adjustment and understanding the effect the training may have had on the athlete, or whether the feedback was expected from the training I set up . The question I discuss in an email exchange is the ability to use THb as a trend information of changes in vascularisation. Time will tell. I have a group of clients, where I try to see, whether this is possible. a) more after 3 and 6 month of specific " vascular " intensity workouts. ( if it is really a vascular stimulation) compared form the start by the same load. Problem is, that many other factors will change the behavior of THb. Respiration , muscular strength and therefor % of contraction force by the same load, even flexibility on a bike and so on. The reason of this idea is based on a very nice article I showed long time ago once here already. Here again the interesting read. impact of compensatory structural remodelling, as arterial lumen size and wall thickness both affect functional responsiveness. In summary, there is clear evidence for an impact of athletic status on arterial structure and function, at leastwith respect to the impact of endurance training. Arterial adaptationmay, to some extent, emulate that evident in the hearts of endurance athletes, and it is tempting to speculate that similar mechanisms may be at play. Now going back to the great data collection from Dominique. Here some directions for regular user of MOXY and some thoughts. Each of this different blocks had a very specific stimulation on the system. True , there are all swim related workouts but each had a very different physiological outcome. You can see this much better, when looking at THb than when looking at SmO2. 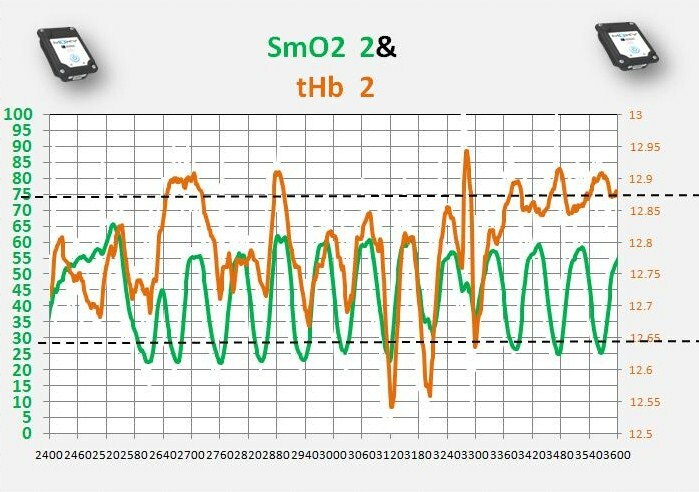 The loads are all in the range , that SmO2 most likley never reached a critical low level to create a hypoxia stimulation. There where just different reason why we had this 3 different reactions in SmO2. More interesting is the very different reaction when looking at the delivery system and as such at the THb trend. # completely different out comes with the first set a very different reaction in the recovery phase compared to the other 2 sets and the last 2 sets a direct opposite reaction with one decreasing the delivery ability in the rest phase and the other reducing delivery during the load phase. if we look at this three options we can make some very interesting planning. Here a suggestion how we do this. 1. Assess the athlete in a race situation. 2. Look how the body reacts in SmO2 and THB. This gives you a direct information, whether we have a delivery problem and whether the delivery problem is based on respiratory limitation or on muscular limitation or in very rare cases based on the cardiac system. In any case the race information will show the limitation as it is an all out case. Than we know form this three sets, what we can stimulate and now you can go back and instead of doing all three sets you may focus on the set, which most likley will reduce the limitation we found during the race. Here from the same great source ( Dominique ) and another great example how MOXY can give us feedback . This is a swim set with 12 reps in the same set. Even if you are a new starter you can easy see, where the delivery of O2 tHb ( brown ) is going in a very different way than at the start. Now you can see, that thnaks to teh " intervall" interruption of teh kload we get a lot of feedbacks. So in a test, where we simply add step by step load we never ever get the feedback whether we create a delivery problem and or an outflow problem. This here is a great example of an ??????? If you look closer in the overall info of the 12 reps you can see the change coming in the way tHb reacts what can you see ? 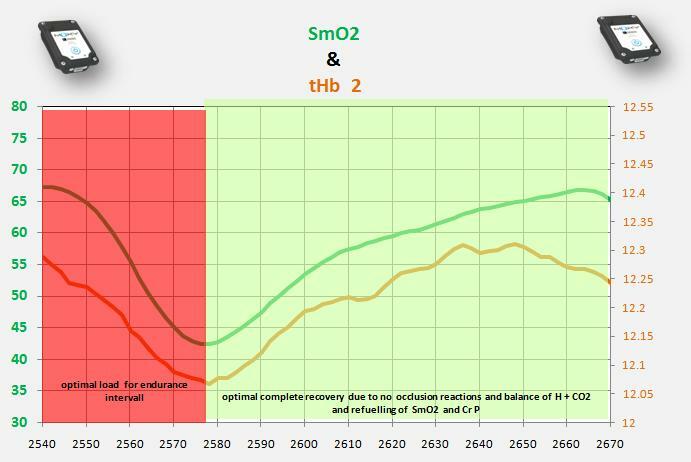 Now here just for fun a comparsion of the 2 swim athelets in tHb and SmO2 behaviour over the full workout inclsuing warm up. I am loooking at one of the last pictures ( the set of 12 swim repetitions) and very interested since as I recreational cyclist I often perform this kind of workout. If I look at only tHB I would say that this guy is recovering (tHB increases) but from SmO2 there is still a load applied. My only explanation is that he is not able to strongly contract the muscles so the load is low but the dissociation curve is shifting to right causing the SmO2 to still drop. ...but I am not fully convinced.. If this is the set in questions than I assume you talk about the tHb ( brown trace) at the end so lets say the last 7 loads ???? here the pic to get it better ?? 1. 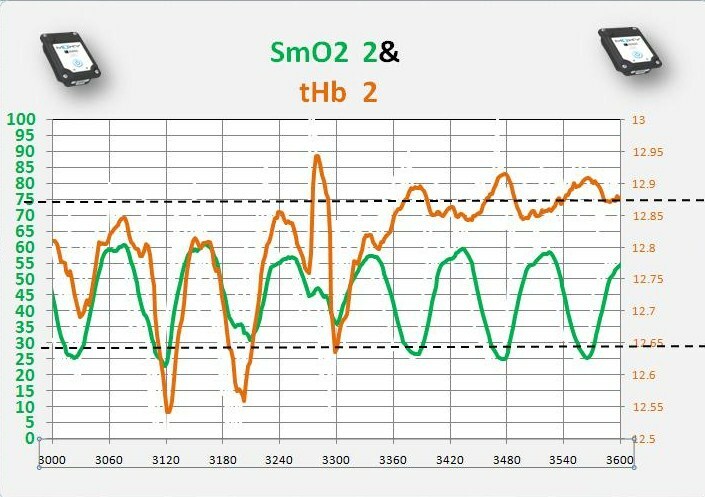 A high CO2 can in fact create a nice drop in SmO2 due to your suggestion of a shift of the O2 diss curve to the right. We use this fact often in our seminars to demonstrate how we can change O2 bio availability by doing nothing , and with nothing we mean holding your breath and SmO2 will start to drop. The reaction a high CO2 can create is as well interesting for " lactate " believers. 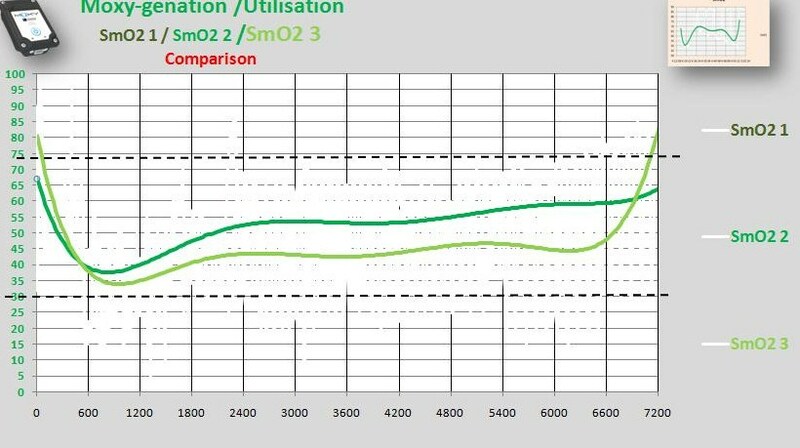 If you ride at what some call MAX LASS and you start to create some hyper capnic reaction ( breath slower and deeper ) than you will create a drop in SmO2 as you release more O2 and for a certain amount of time your lactate which may be somewhere perhaps around 3.6 +- what ever will in fact start to drop despite a drop in SmO2. On the other side you go and breath hypocapnic your MAX Lass value will increase despite the fact that SmO2 is increasing. 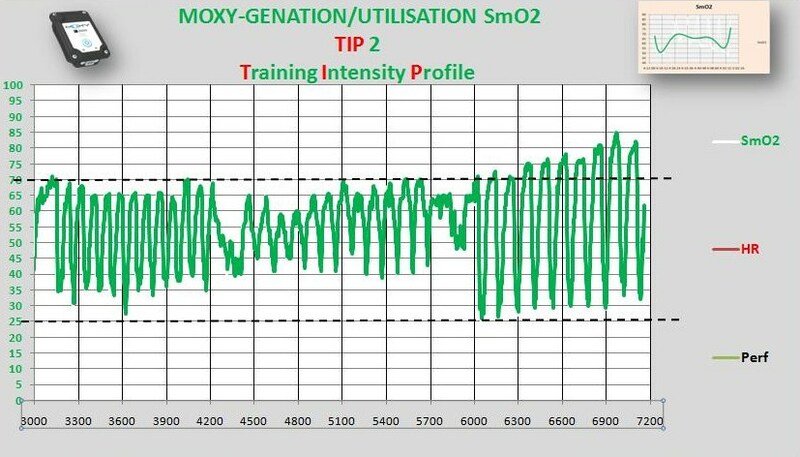 This is one very simple test to show that lactate trend and MOXY real live info simply do not mix and any attempt to use a lactate idea and force NIRS into the old classical system is just an attempt to hang on some interesting but outdated ideas, which now can be replaced with new information's we can gather with new technology. 2. Than to your thought. Indeed an increase in CO2 has a vasodilatation effect and the increase in tHb could be in fact a sign of a vasodilatation due to an increase in CO2. This seems to be the current ability to use O2 and than she is getting a utilization limitation and can't for the moment or at least with this workout desaturate further down in the tested muscle group. There are different reasons and there are different training ideas, where you can change that. In this case the coach knows now , that there is quite some improvement left in that area . Any other assessment idea ( VO2 max LT At FTP ) never would show this information. Can it be improved ? Here an example from TOP NHL player courtesy of Brian Kozak ( Next level coaching ) changes of desaturation ability over a certain time and training period. where as after T 3000 SmO2 trace drops but tHb trace is more or less immediately increasing. First of all . If we believe in the idea below. How come, if we believe NIRS is actually doing what NIRS claims to do, that we see in any activity of short intense duration a drop in SmO2 as an indication of a intends involvement of O2 in the initial muscle activity. How come that athletes who can desaturate SmO2 much further can sustain an all out performance much longer ? Is there any science paper, who proof the above graph?. Any reader please show it on here. BUT there are some very great studies done, who would completely disagree with the above graph like the ATP stores dropping as it is learned and thought in school. Here a very short one out of Connett et all. So back to the point but all has some merits to it. 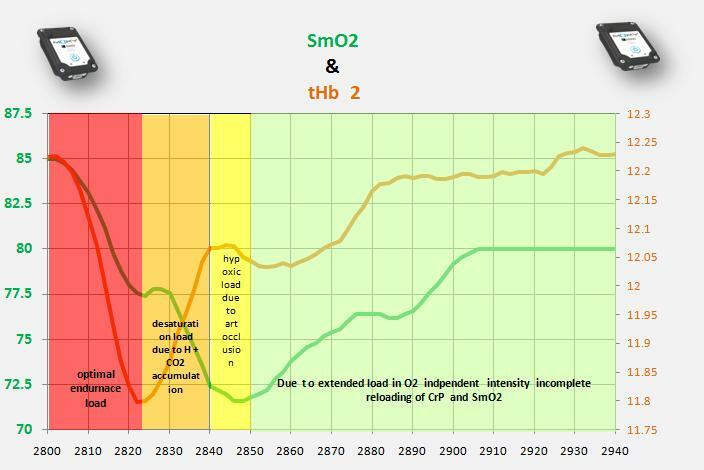 Before the t3300 you can see a drop in tHb and SmO2 as an indication of immediate utilization of O2 and this with a muscle compression or performance, which creates a tHb ( blood ) outflow due to compression of the blood vessels..
Now after T 3300 we have the same utilization of O2 indicating a similar energy demand or at least similar O2 utilization ability but this time the muscle performance contraction in this stroke workout creates a much higher muscle contraction , in fact withe exception of the first load, where we see a very short out flow followed by an increase in tHb we have every load a strength involvement above for sure 35 % of maximal strength and as such we create a out flow problem due to compression of the venous blood vessels. In other words the load or compression of the muscles is creatingvenous occlusion and as such we have the same amount of blood inflow over the arterial system but we have a reduced outflow flow over the venous system and blood starts to pool in the tested area. In some sports like rock climbing or motocross or strength workouts the athlete would describe it as muscle pump feeling. So the potential idea, that we have a similar O2 utilization but a much smaller muscle load would argue, that with less muscle activity we would have less CO2 production and therefor unlikely a vasodiltation. BUT we can artificially produce this by holding breath and or there would be theoretically another option, where we use similar amount of O2 but less muscle contraction force. ( Cardiac limitation with a reduction in motor unit recruitment. This would end up with a much slower performance in the workout but as we can see as it is in a pool same end time as they all swim 25 or 50 meter. .
Summary . The higher tHb in this case is a indication of a much higher muscle contraction force creating a venous occlusion and as such an increase in tHb. 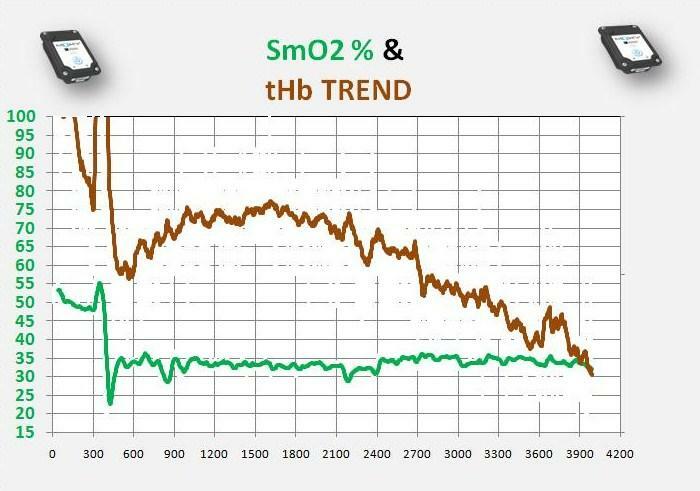 You can see before T33000 as the SmO2 increases so does tHb as a sign of reduction of muscle tension at rest and decompression inflow to base value. In the section after T 3300 you can see as SmO2 increases tHb drops as a sign of relaxation of muscle tension as before but now a venous occlusion outflow back down to base line. Many thanks for this great analysis. First of all, yes I was referring to the workout you analyzed (in particular from T3300). If I understood correctly, the athlete put the same "power" as in previous loads, but now the contractions is creating a venous return issue causing tHB to rise instead of falling. I can see that from that point is completely out of phase compared to SmO2. What are the consequences of this? Will the athlete be forced to stop after few extra loads? And last,if I can ask, what kind of training would be appropriate to improve this "weakness"? a) we are not sure, whether this athlete put the same "power" into this repetitions. Remember, it is a swim workout so we would have time as a comparison. Now we are not that interested yet into the time but it is helpful as well. You can see a little or no time difference but in this length of an interval we would have to look accurately at the performance. The fundamental difference in how we use physiological feed backs to current ideas is, that we look on what we see live or in swimming short after. so here what we would do in this case. 1. SmO2 drops similar and recovers similar. So what ever was done in this swim workout created a similar O2 utilization ability for this muscle. 2. 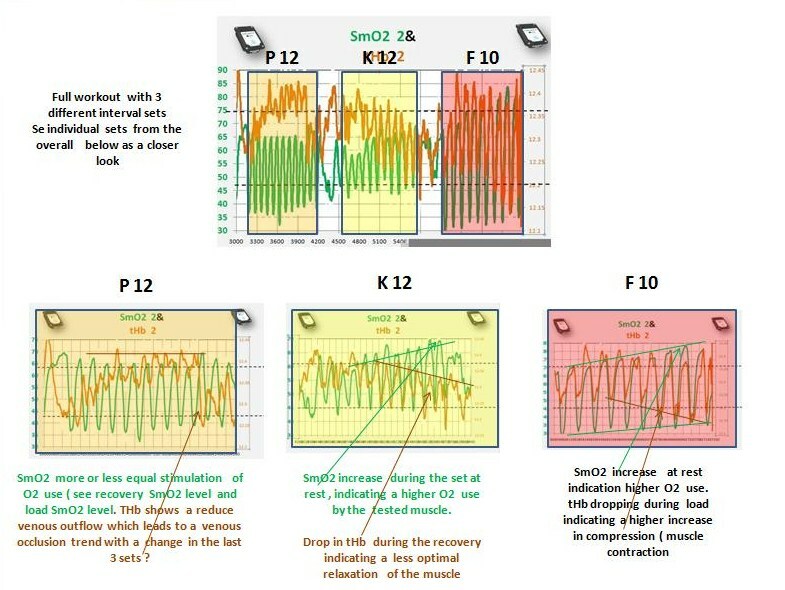 The blood flow ( or volume ) in the tested area clearly changes at the T 3300 point from a compression reaction tHb drops due to muscle contraction in this working muscle compared to the exercise the swimmer did after T 3300 , where the same muscle created a higher muscle contraction which was so much stronger, that we see an outflow problem ( venous occlusion trend) which means same or more blood moves into the working area , but less moves out so we have this pooling and as such an outflow ( drop of tHb ) as soon the load is over.. Question " is this good or bad. Non of them can be answered for a workout. For a race. it is not optimal , as we get rid of a part of the balance of the H+ buffer ability due to outflow restriction. Here an example of 2 athletes doing the same planned workout of a aerobic lacticid workout. Classical trained coaches like me would have learned , that this is anaerobic alacticid. So the workout was a endurance workout for a hockey player. Duration of the workout was planned for 45 min. The workout was the same for both 15 skate imitation jumps uphill followed by an individual rest period till SmO2 ( re oxygenation reached the same level. This means the rest time was for sure different for recovery , but the load idea was the same with 15 explosive jumps. the workout results will show you what went wrong with the athlete who was not able to sustain the 45 min at all versus the athlete, who had no problem at all.. The result of this workout than was used to not only individualize the recovery time but as well the load time. first you see the overall view of both athletes. The above athlete completed the workout from Davos 1600 ma.s to 2300 m a s.in 45 min +- without any problem .It was a great aerobic lacticid workout. We do not care about the lacticid too much with some exceptions, when we plan to stimulate either MCT 1 or MCT 4 proteins. Look at the red circle and it is a similar situation as with the swimmer. 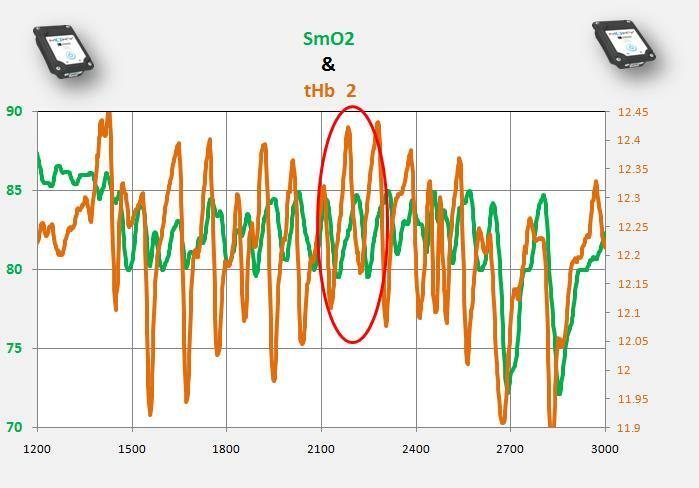 You see the full load of 15 jumps and SmO2 drops due to aerobic involvement ( opens the question of the validity of the old classical idea of energy use. 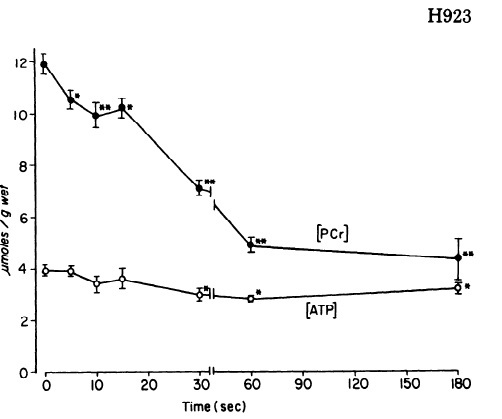 So the workout from this athlete shows a steady use of O2 even immediately at the start of , what some would have called anaerobic alacticid load. We see a steady drop in tHb due to the steady increase in muscle contraction as a sign of increasing of motor units ( SEMG would go up ) but not hard enough to create a venous outflow problem. So we have a non interrupted inflow a ( some what reduced ) and a non interrupted out flow to maintain a H + balance with all buffer abilities we have including respiration. Now here the other athlete one single load closer view. 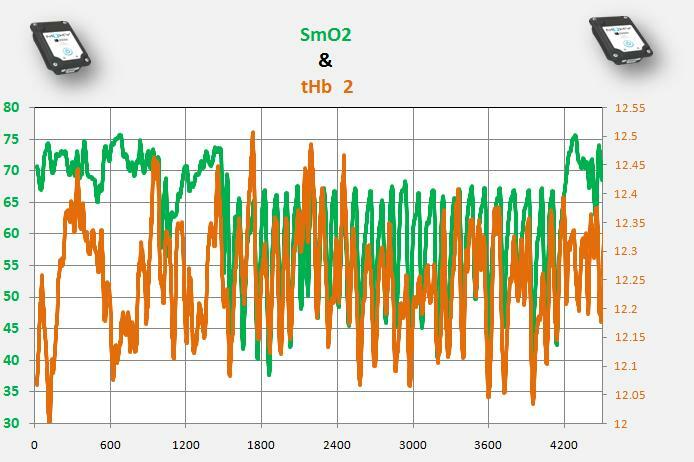 You can see that this athlete needed much more time for 15 jumps and you can see after an initial nice aerobic involvement we have a short " hesitation " to utilize more O2 but than the body improved the utilization ( bio availability ) and more O2 could be used for ongoing exercise. Than we reach a less SmO2 drop which goes to together with a tHb plateau. So red area muscle compression but than start of a venous occlusion up to a short arterial occlusion, short outflow at the end of the test with an immediate increase in tHb but a not optimal reloading of SmO2. So energy storage was slow and very long wait to be able to go again. The tHb overshoot is a indication of a hypercapnic situation at the end of the load and the Hyper capnic situation was a reason of a O2 diss curve shift to the right and a better O2 utilization. But the H + balance was gone ( metabolic plus respiratory acidosis and the feedback stopped the body from further workouts.. So in this case. the same workout had two very different stimulus. If the plan was an endurance workout hockey specific than the first athlete had a good workout, the second athlete had a very different outcome. To offer the second athlete the same stimuli he would have workout out in the red zone so only 20 + seconds an he would have done the same . This i what happens in all clubs and team workouts. 20 athletes and possible even they do the same optical workout 4 - 6 different outcomes,So completely out of control and what is good for one may be not optimal in that stage for another one. There for we have to use an assessment ideas like this , practical workout to adjust the workout or work on the limitation which caused in athlete 2 a very different outcome. Summary in a workout nothing is bad we just have to know what we did so we understand the responses. In a race or game athlete 2 can not be as long on the ice in a shift than athlete 1. So in the swim example. Yes the after T 3300 load had some time limitation or performance drop. If that was planned great , if this happens in a race bad. So work for the coach is to avoid this in a race but may use it in a workout.
. The race has to be as much efficient as possible , the workout can be as much inefficient as possible for may times. what kind of training would be appropriate to improve this "weakness"? If thi happens like in this case in a workout the veneous occlusion is not a weakness but the exercise to produce this trend is a strength of a thinking coach if he knows that he produces this. Now it can be used to get rid of the problem in the race. If he does not recognize this trend , than the workout is out of control and the problem may be aggravated in a race. If we see this in a a race, than we e can go and work on this to reduce the risk of a venous occlusion in the race by different means to improve this situation.. MOXY is NOT a tool to find a magical mysterious point and we name it like XY Max or zt threshold. What MOXY is a is a reality show live to see, what limits performance and who tries to compensate. To find this you go and do a sport specific assessment. A ICE hockey player is on the ice and a swimmer in the water. Or in other words, how many cyclist would pay for a VO2 max test on an Skate mill???
. After the assessment as you can see in this cases. we can get a lot of information and therefor can apply the information in an individual guided workout sport specific or in a general workout needed for this sport. I got some nice and very great feedback on the last post. 1. Why or how would I use tHb for training planning. A : Depending on your assessment for your sport you may actually use tHb for some very interesting options. If for example you find a cardiac limitation like CO over a low SV or you plan to do some vascularisation you will use tHb to control the proper intensity during the load but as well after the load the reaction.
. 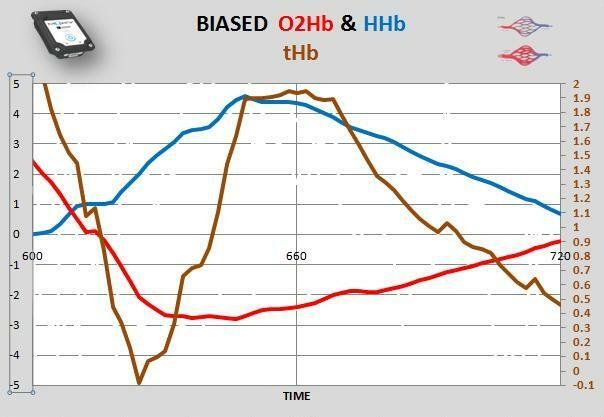 Depending on the ideas you use as a coach you therefor can control the training intensity instead of based on wattage or HR " zoning" on actual live physiological feedback, where on one day you may use much more load to create the same tHb reaction than you may produce on another day with less load. This makes a zoning really obsolete as MOXY is the zoning as we check live what we do. Why would I calculate a zoning , than base it on a HR or wattage level after I did a LT an than believe it will work every day, when I now can have a live feedback and see , whether I ma in the planned zoning or not. Below is some screen shots from a recent biathlon test race on roller skis, it was a undulating course. Moxy mount was on the legs. 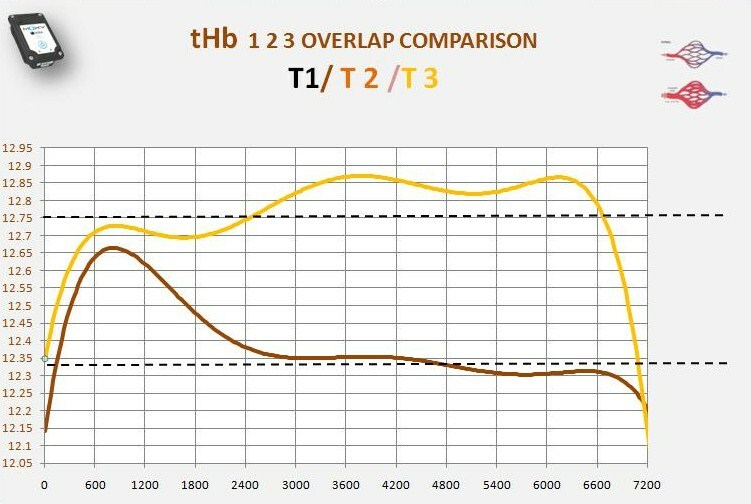 After the start there is the initial alarm response then the tHB response is upward, after each lap the tHB seems to increase even more. Each lap was around 09min. I do not always see this upward tHB response. But it is easier to see in longer interval type workouts. 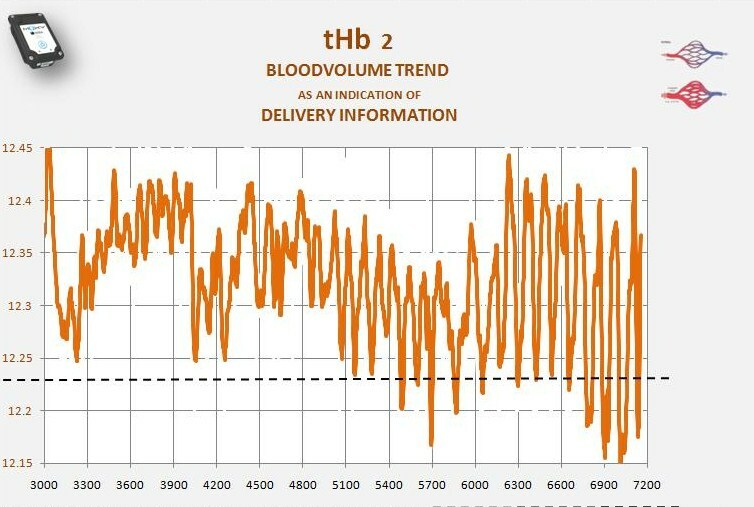 So here my question, am I right when I say that the general upward trend in tHB is most likely due to an increase in SV be it through plasma volume or actual stoke volume? SmO2 does not really change lap to lap. So utilisation is simply where it is, SmO2 is able to recover during the short downhills and during the shooting bouts. 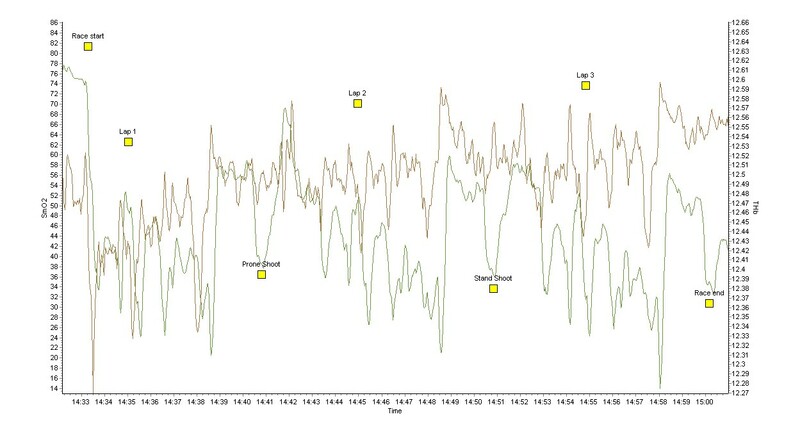 Here a screen shot similar time period with Heart rate and top and SmO2 blue bottom. Marcel great work here what I need to get somewhat closer to some ideas. Can you sent me the csv file you download from MOXY so I can move it in our interpretation software. As ell if you have your HR downloaded and you can move it on an excel format that would help so I can move it in as well. Will be back after I look through your points.